The following list details a few things that we do at Seattle HEMPFEST to reinforce our commitment to our community and our planet. Seattle HEMPFEST’s leadership worked proactively with Dr. Roger Roffman, formerly of the University of Washington School of Social Work Marijuana Treatment Program, to produce a 10 card handout series that addresses 10 cannabis risk categories, i.e., cannabis and lungs, cannabis and driving, cannabis and teens, etc.. The cards are distributed free of charge at the event, and the info is available on this website as the Gutchecks under the education drop box. Seattle HEMPFEST respects all first responders greatly and we have proudly proclaimed that at our event every year. While HEMPFEST cannot control all of the messaging coming from its guest speakers, from the beginning HEMPFEST declared a “no human enemies” policy, focusing all attacks on issues and policies rather than personalities. We consider HEMPFEST to be a hate-free zone where the focus remains on ending prohibition. Hempfest personnel spend several months attempting to return items that have been turned into our Lost and Found during our annual events. Many wallets, purses, cell phones and important pieces of identification are returned to original owners every year. We wish more people would have updated contact info on their valuables. 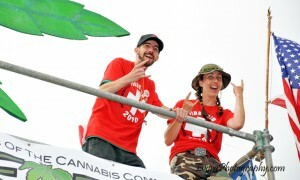 To aid Seattle HEMPFEST in its Safety First approach the event has a trained volunteer First Aid Staff, complemented by multiple Seattle Fire Department Medic One personnel and a Medic One ambulance parked on-site. While HEMPFEST spends $14,450 to have professional medics and ambulance who bring AED’s (heart defibrillators), because our event venue is so long we secure extra AED’s for use on-site during the event. Hempfest has two people certified as CPR trainers. Seattle HEMPFEST management makes sure there is an ample supply of water commercially available during the event. In addition, a 3,000 gallon water buffalo truck is secured by Hempfest and located within the event so attendees can access water free of charge. During extreme weather bottled water is also purchased and made available free of charge for specific stage areas where audience members tend to get dehydrated. 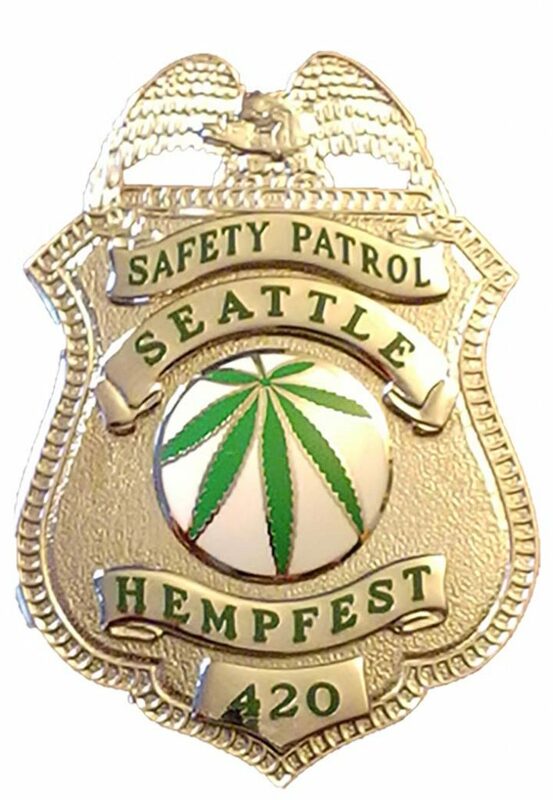 The Seattle HEMPFEST Safety Patrol is an internal volunteer security force that secures and patrols within the perimeter of the Hempfest event. 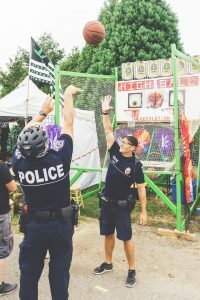 The HSP members undergo specific safety and de-escalation training, and are trained in the policies of Seattle HEMPFEST. The Safety Patrol coordinates with the Seattle Police and Port of Seattle Police in the course of the event, as well as Burlington Northern Railroad Police, and Amgen/Expedia and Seattle Art Museum security. Seattle HEMPFEST worked with Lyft to develop offer to attendees for reduced rate in an effort to reduce vehicular impact. Seattle Hempfest’s Safety Patrol has enacted a Code Adam lost child protocol and training to respond effectively in the case of a missing child at the event. Every year Hempfest organizers meet with community stakeholders including businesses and residents impacted by the event to listen to and address their concerns. 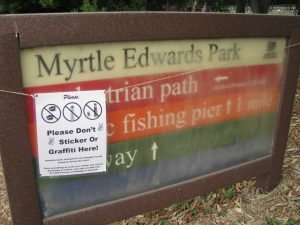 Hempfest spends thousands of dollars every year both to prevent graffiti in and around the event, and to clean graffiti left on public and private property. We use clear pallet wrap to protect vulnerable art installations, light stanchions, and other structures from graffiti and vandalism during the week of the event. WE spend $10,000 annually to lay steel sheets down on the entry of the Olympic Sculpture Park to protect its structural integrity from our heavy equipment trucks during the load in and load out process. We also pay to light up the Olympic Sculpture Park to prevent graffiti during HEMPFEST weekend. HEMPFEST instituted a “community impact form” on its website where people can upload photos and describe the time, place, and nature of the community impact, be it trash, noise, or some other disruption. 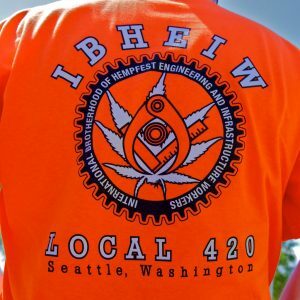 The Seattle HEMPFEST Ecology Crew is a volunteer driven refuse management operation that works almost non-stop within the event to handle the large load of trash the event generates. The Ecology crew is complimented by a paid crew that comes up from Oregon to assist in the sorting for recycle, compost, or landfill. 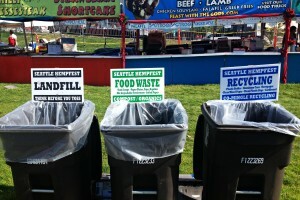 HEMPFEST routinely processes around 500 cubic yards of trash. On average, a cubic yard of loose waste (i.e., a self-haul load) will weigh between 250 and 350 pounds. HEMPFEST contracts with an outside agency to clean the surrounding areas outside of the event where attendee trash can sometimes be present. Seattle HEMPFEST raises funds that are then transferred to the commissary accounts of Americans serving life in prison for nonviolent cannabis offenses. $2,000 was contributed in 2015 alone. 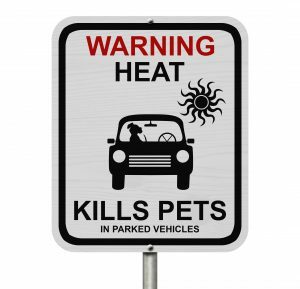 Organizers have proactively worked with representatives of the Seattle Animal Shelter to produce prevention and awareness messaging to educate attendees about the danger of pets left in hot cars, and other pet owner issues. For their own protection HEMPFEST is a no pets event. HEMPFEST strictly follows all local, state, and federal service animal laws. animals or babies on-stage, ear protection warning signs, and emergency stage clear directives. Specific stage clear rules have been developed to respond to severe weather incidents like lightning and windstorms. Drone use is restricted at Hempfest. Seattle HEMPFEST costs $850,000 to produce. In 2014 we worked with a University of Washington professor to develop an economic impact study that revealed that Seattle HEMPFEST festival patrons spent approximately $7.1 million in King County in relation to their visits to the festival. Volunteers and musicians were estimated to have spent $0.226 million in relation to their participation in the festival in King County, while Seattle HEMPFEST Festival exhibitors and food vendors are estimated to have had expenses of $1.8 in relation to participation in the festival in King County. In addition, Seattle HEMPFEST Festival organizers incurred costs of $0.924 million, of which $0.744 million were made in King County. In 2015 Hempfest ATM’s distributed $400,000 on-site. 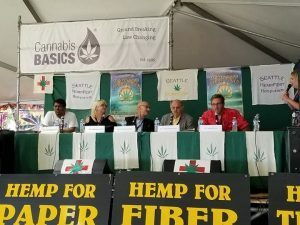 Panel discussions with movement and industry leaders occur each day at the giant 100 foot Hemposium tent, and over 120 speakers participate on 4 stages during every day of HEMPFEST. Organizers have made presentations at colleges and schools in the greater Seattle area, and thousands of community volunteers have received hands on experience in various aspects of event production and management. Members of certain volunteer crews have received free annual training that can be used in their private lives. Built to last, and operating since 1991, the Seattle HEMPFEST organization is the oldest continuous operating cannabis related business or organization in Washington state. See our platform to see what we have in store for the next 25 years.